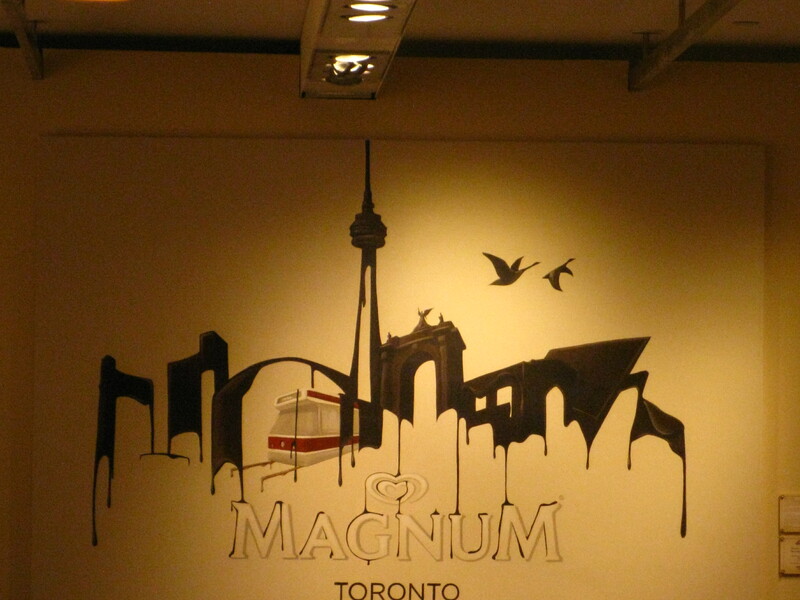 I went with a friend to Magnum Toronto after work on the last Wednesday that Magnum Toronto was open. It’s a slight shame that the store is only a seasonal 2 month-thing. I’ve had Magnum ice cream bars before in Asia, specifically in Indonesia since they’re only slightly over $1 over there so at first I wasn’t interested in going to Magnum Toronto. The magic words were edible gold. These magic words were followed by unlimited toppings for $6 and you could get bacon bits on it. 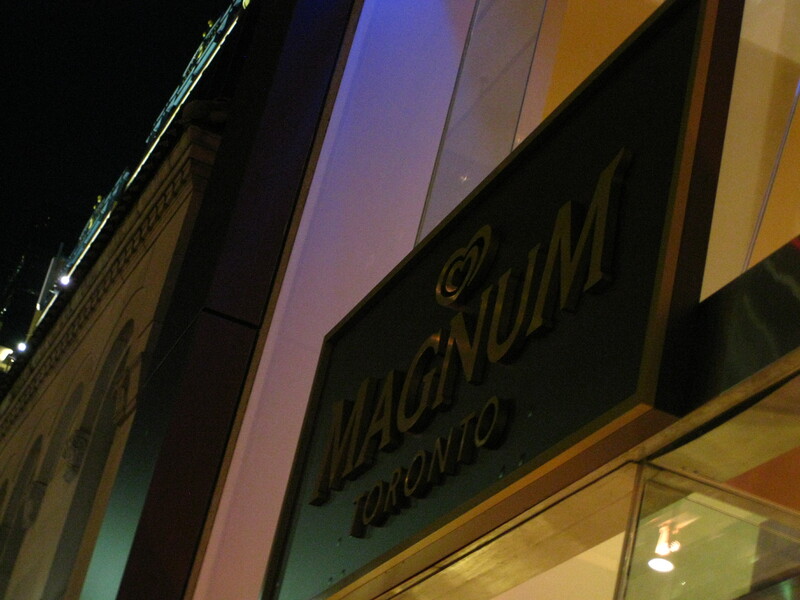 Prior to my first/final visit, I had passed by Magnum Toronto but the line up outside of the store deterred me from getting it. However I was determined to get it before the store closes. I lined up around 7:30pm with my friend who didn’t want Magnum because she had it twice already and we waited for nearly 1.5 hours before I was able to order my Magnum. I got the chocolate Magnum dipped in dark chocolate with literally everything. Literally everything means goji berries, dried coconut, macadamia nut pieces, white chocolate vermicelli, crumbled french macaroons, Canadian maple fudge, crushed popcorn, chopped hazelnuts, crumbled biscuit, chocolate flakes, chopped almonds, chocolate rice crispies, honeycomb, toffee bits, popping candy, rock sea salt, nerds, chili flakes, bacon bits and some kind of edible gold. At first they told me that they ran out of gold nail polish when I asked for edible gold on my Magnum but they said that they had a substitute. The only thing my Magnum was missing was the rose petals and dried strawberries which they ran out by the time I ordered my Magnum. 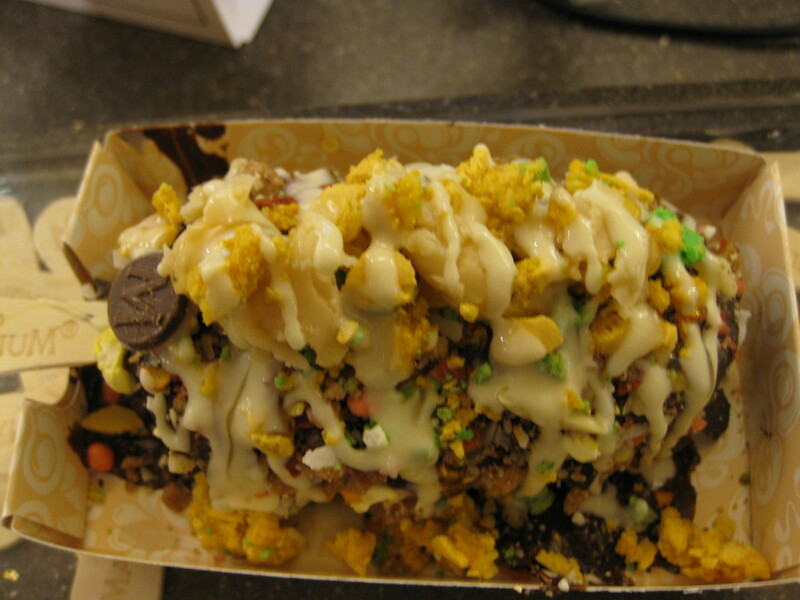 On top of all those toppings, I had white chocolate drizzled all over it. I absolutely loved the crumbled French Macaroons and Canadian Maple Fudge. The bacon bits were interesting. The chili flakes made it really spicy which was nice. The rock sea salt was too salty for my tastes. Overall, it was $6 well spent and well worth the 1.5 hour wait. Would I do this again…..it really depends.